I think I misunderstood the happiness formula. When the guy who gave the TED lecture said note three things that made you happy and (stupid word usage alert) “journal” about them—I think that is supposed to be one thing, note them and write them down. I don’t think I need to write three things down and also expand on them in a journal entry. 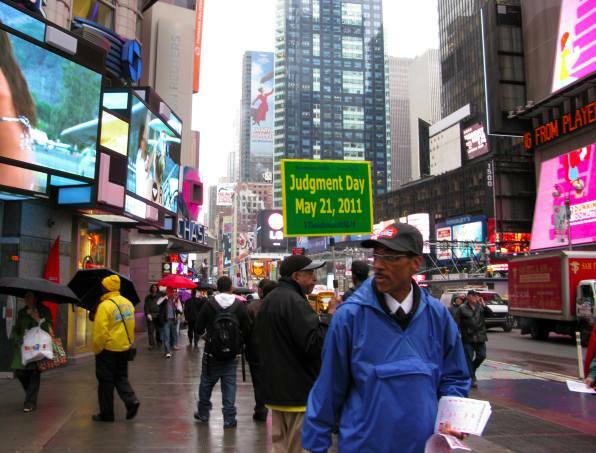 One happy thing from yesterday: that guy holding up the judgement day sign below? He’s probably crazy. The smell of the rain, a coupon for free cat treats, getting out of the focus group early. “PROBABLY crazy”? I wish I knew for sure, then I’d take the rest of the week off. Apparently there is a group of people out there who think the world will end on the 21st. Hahaha. Yeah. I just read though that this is what’s going to happen — the good people will be raptured, the rest of us will remain and get killed in some catastrophe I forget how many days later. So only the evil people will be left on Sunday. I’m looking at you Finney. There are people who have taken out all their life savings and spent it either on promoting this event or on their “bucket list”. Almost makes me hope it happens for them.